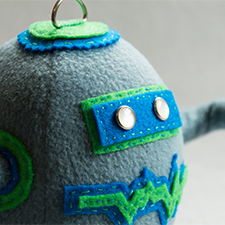 This project started as an idea while shopping at the craft store. I came across two different materials that I wanted to put together. 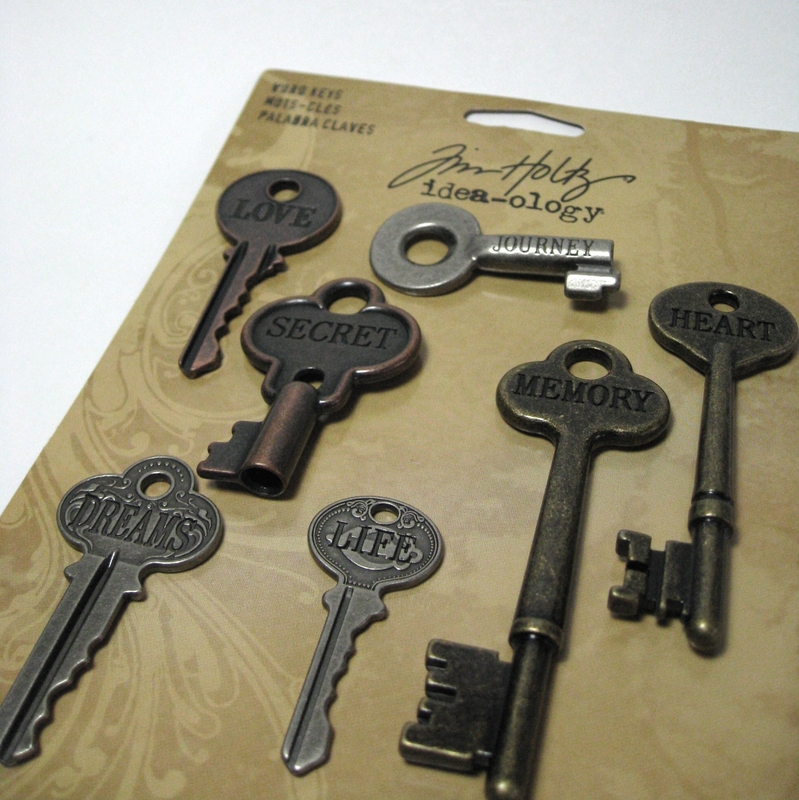 One item is a great set of decorative keys from artist Tim Holtz. The other item was a package of five sheets of tissue paper. This tissue paper is 12 x 12 inches and I found it in the scrapbook section with all of the single sheet papers. As soon as I saw the paper I knew I wanted to make candle holders. 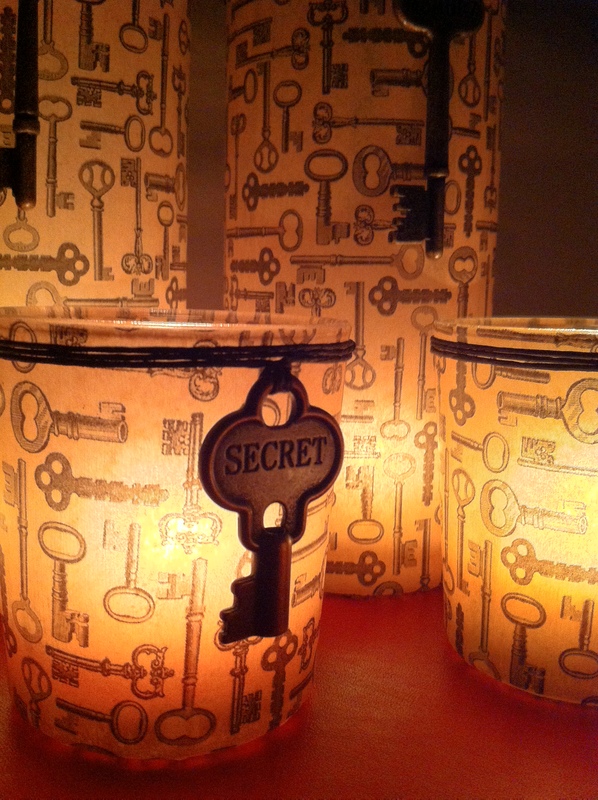 I had made one tissue papered candle holder in the past and love how they light up with a nice glow. This particular paper has a nice warm color to it, almost like antique paper. The best part, it’s covered in keys! 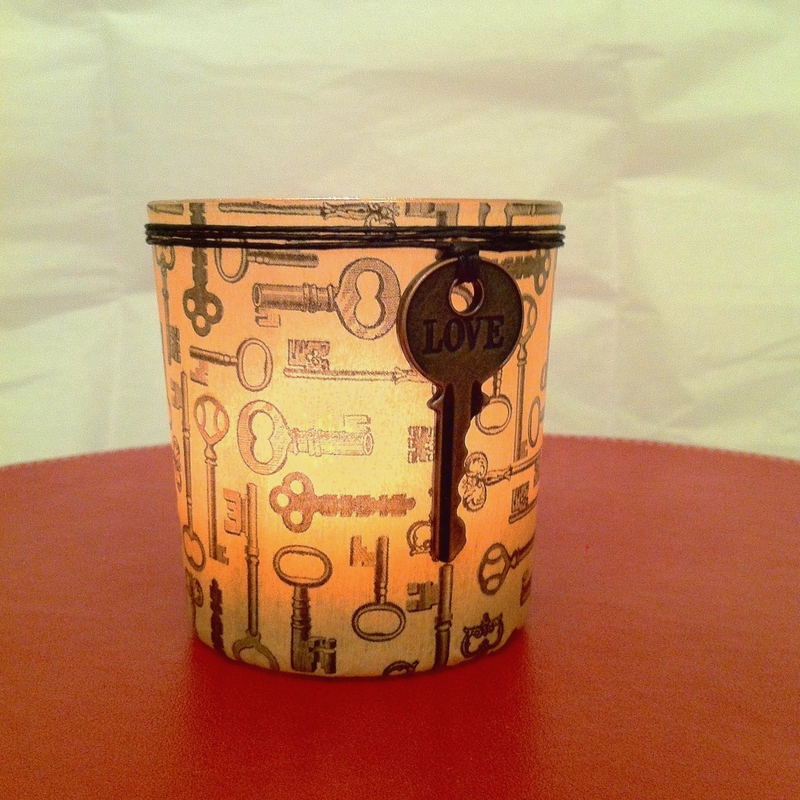 An all over print in black of many styles of keys lends itself perfectly to being paired with the decorative keys. To complete my materials list I needed to get some clear glass candle holders. 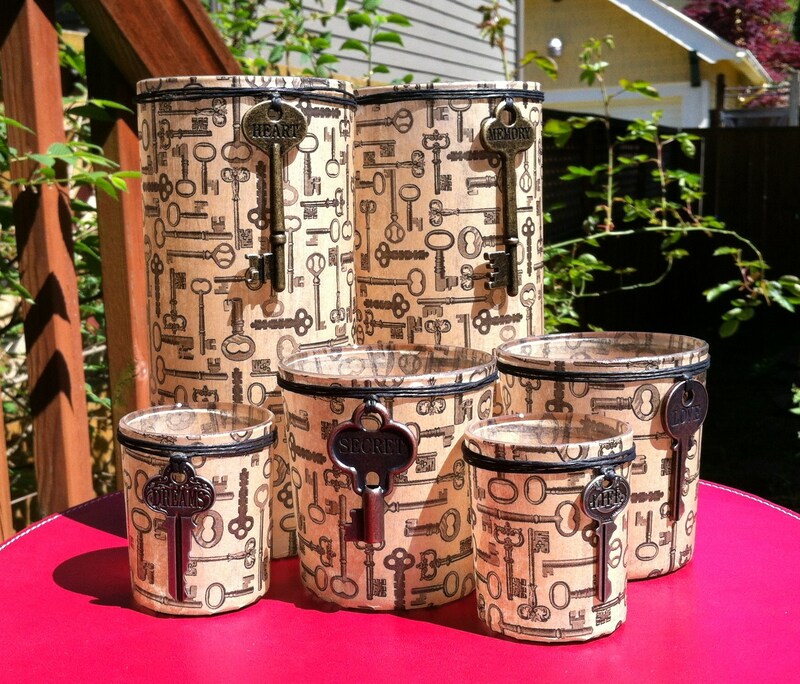 I had seven keys to play with so I wanted to make six holders that could be split up into two sets of three. I went to the Dollar Tree for my largest glass cylinders, these sell at other stores for much more, always check the Dollar Tree! Finding small votive size glass cylinders was also easy and inexpensive. The medium size proved to be a little tricky. I looked lots of places but the glass was either curved or has a decorative bottom or top edge, I couldn’t find a plain cylinder. Finally, I found some drinking glasses that look just like my large and small cylinders. Now for the fun part, papering the glass pieces. I used Mod Podge in matte finish with a foam brush. I painted a few inch wide strip on one side of the glass, top to bottom. I lined up the edge of the paper with the top of the glass and pressed it down. Smooth out the bubble as you go, gluing in smaller sections makes this easy to do. I had wrapped my paper around before gluing to cut it down to size. Leave a small overlap and glue the edge down. Now you have a clean top edge but too much paper left on the bottom. Cut strips down to the bottom of the glass. Trim the strips so that they reach about the middle of the bottom when folded over. Give the base a coat of Mod Podge and then one at a time, fold over your strips of paper. You will end up with a nice spiral covering. 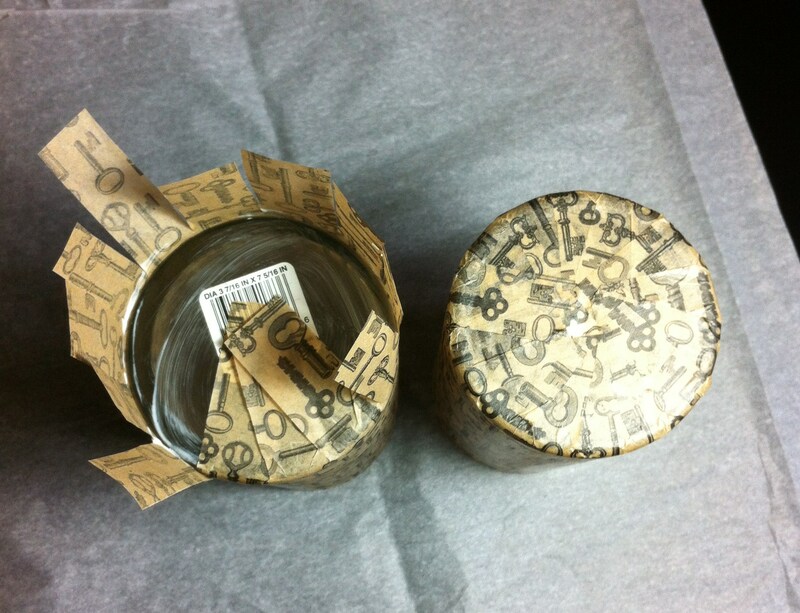 Once you have papered each holder, give it two coats of Mod Podge, letting it dry between each coat. This will keep the surface in good shape, tissue paper is delicate stuff! When your pieces are dry, I suggest adding a finishing paper to the base. I always like how it looks. 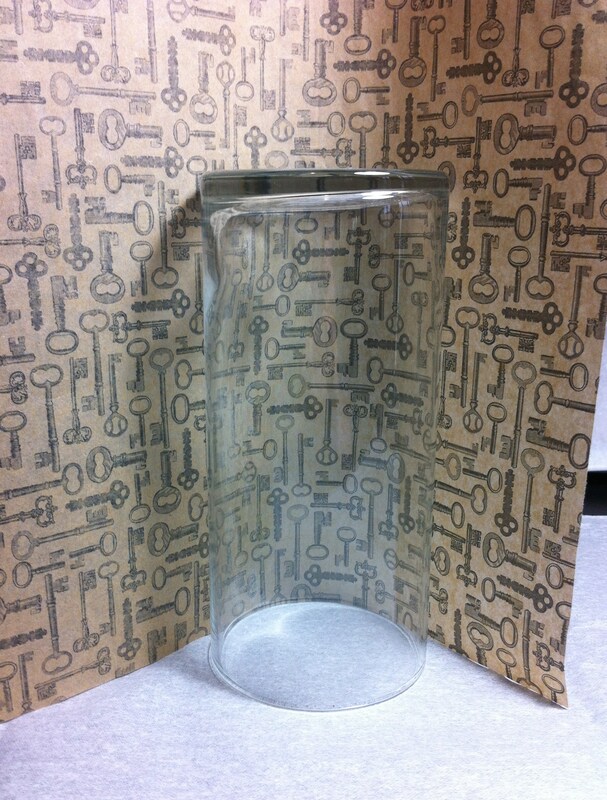 I used brown velvet paper and double-sided adhesive sheets that I cut to fit each glass piece. 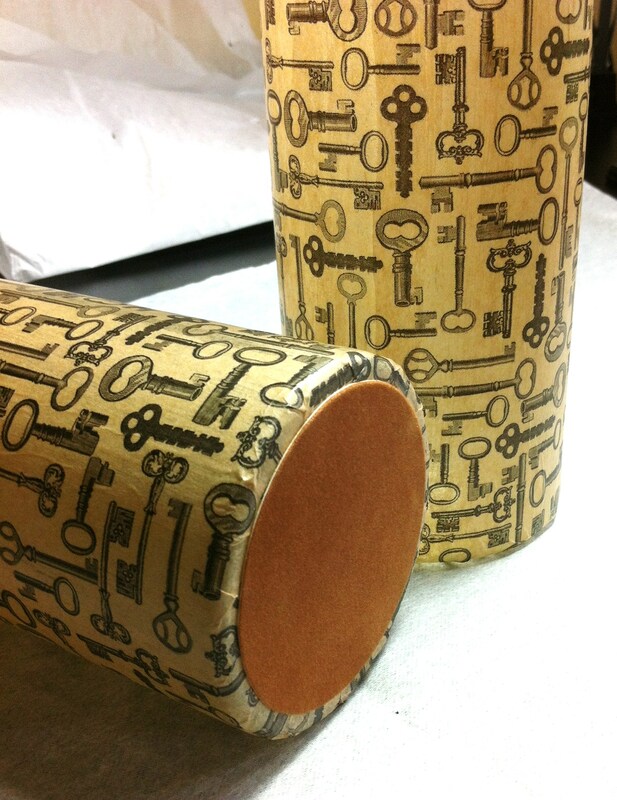 With the papering done, it’s time to add the metal keys. I chose to use black paper chord, also from the craft store. I wound it around the top three times, added a few inches and cut, do this for all of the glass pieces. I folded the chord in half and tucked it into the hole on the key, creating a loop that would allow the key to hang flat. I used a small dab of hot glue to initially hold the key in place, just behind the paper chord. Wrap the chord around and tie in the back. I used a thin line of Elmer’s white glue around the top of the chord, just to keep it from sliding down. It dries clear, you just need a little bit. The keys will make a clanking sound on the glass, I just put a tiny piece of Glue Dots Line behind each key to hold it flat. The finished pieces look so great. I took some outdoor pictures as well as some pictures of them lit up. I love how these came out, and I made them all for about $20.00! The possibilities are endless with this project. Tissue paper comes in all sorts of colors and patters. 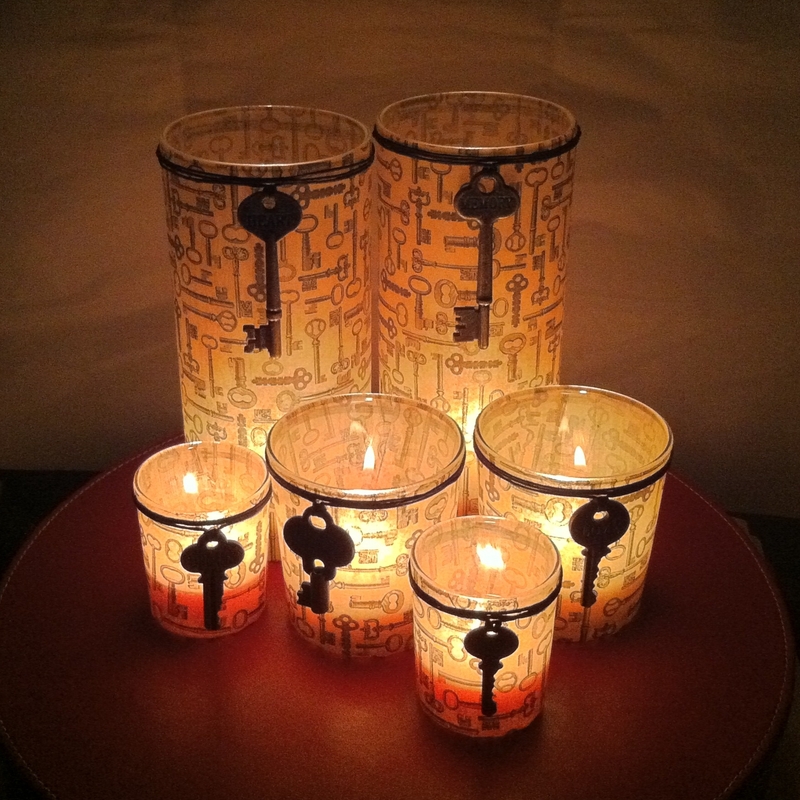 With inexpensive glass cylinders, you can make these for every occasion. You can leave off the embellishments and save more money. Try making a bunch next time you need centerpieces for a special event! If you want to make them as wedding favors, use battery operated tea lights. At the end of the night, your guests can take one home! And, without touching warm glass and spilling hot wax everywhere, they will be more than happy to take them. Enjoy! 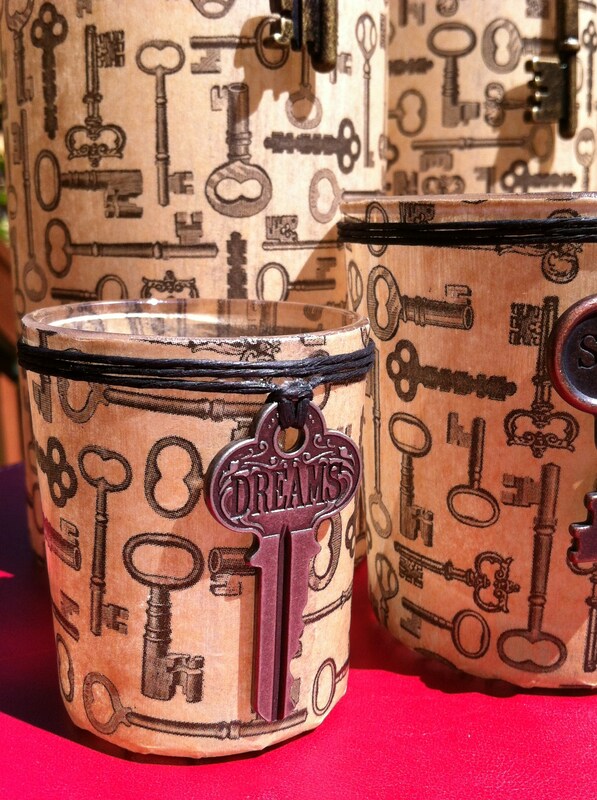 You may have noticed a few places around town where you can paint your own pottery. If you thought this meant you were limited to bowls and vases, think again! I first experienced DIY pottery more than ten years ago. My mom took my twin sister and I to a pottery place where we all painted ceramic star shaped boxes. We still have them, mine has sat on my nightstand all these years. Even though I had a blast and love the finished box, I never managed to go back and create something else. That changed when Groupon came along. 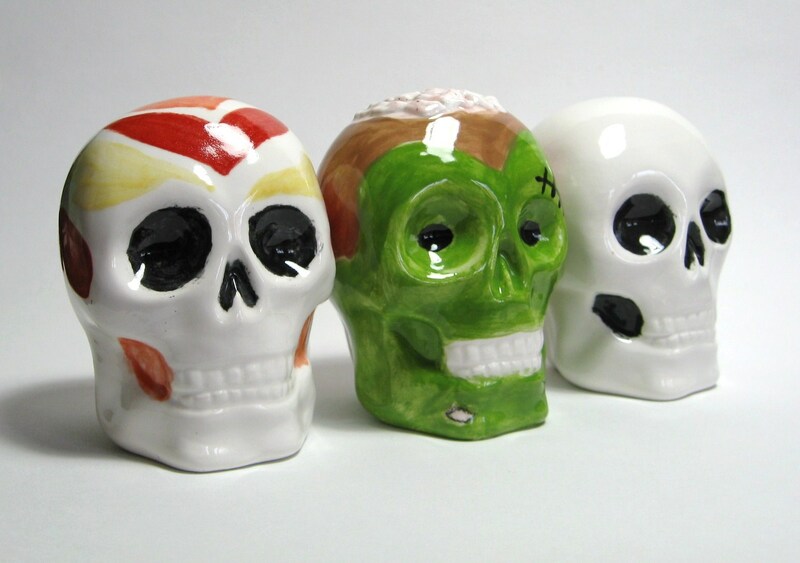 Painting your own pottery can be pricey, depending on the item you choose to paint. If you happen to catch a deal on Groupon, you can pay about $12 for $25 worth of fun. The deals may vary, I’ve gotten a few for a couple different shops and highly recommend taking advantage of these offers. 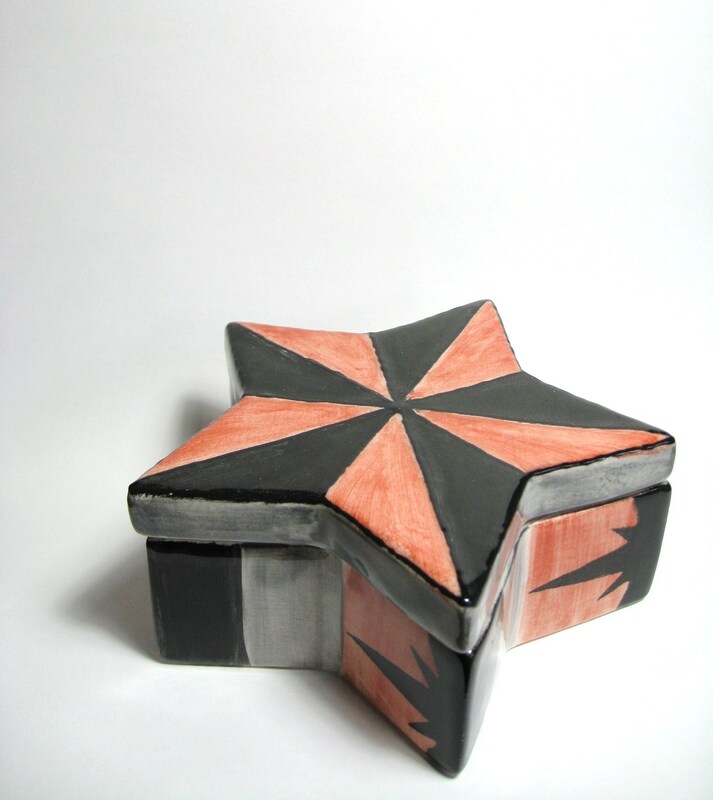 For the cost of a movie ticket you can spend hours painting an object you can keep forever! My sister and I purchased a deal along with a friend of ours. This one was for Ready Paint Fire in the Pearl District. We decided to go on a week night, you can call ahead to make sure they have room for everyone. Inside there are neat little tables all set up. The lighting is great, the shop is comfortable and very clean. You can even purchase beverages to enjoy while you work. When you first walk in you will see lots of shelves stuffed with unfinished pottery. Everything is a blank canvas and the choices are endless. You can spend a few dollars and make small magnets, or you can spend more and make huge pieces. The staff are very helpful and will instruct you on what to do and how to pick colors. This is not something to be intimidated by, you can make things as simple or as complicated as you want. If you run out of time, you can have them hold your piece until you come back to finish painting. If you’re like me, this will happen to you! When you do finish your masterpiece, you leave it at the shop to be fired. In less than a week, you can pick up your shiny new creation and show it off to all your friends! The first time we came to Ready Paint Fire, it was October. They had a good selection of Halloween items to paint. I chose to paint three skulls to add to my decorations at home. I left one very traditional by adding only black to the eyes and to the cheek area for that hollowed out look. The other two skulls were a little more involved. I knew I wanted a zombie looking skull, more comic than realistic. I chose this great green color for the flesh tone. I added a little missing patch on the chin and some stitches on the forehead. The materials available included this great paint that is kind of like puff paint for fabric. 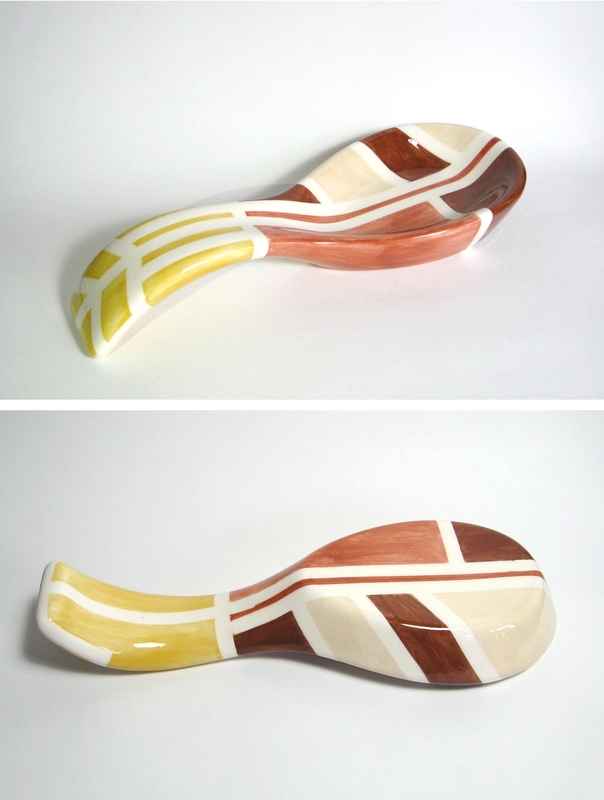 When you put it on, you squeeze it out of a tube and it’s raised and puffy, it cures that way when fired in the kiln. Perfect for making brains! I chose to give my third skull a paint job that reminds me of some of the Day of the Dead skulls I’ve seen. I chose the colors based on flames, like painting a hot rod. I like how these look when displayed together on my mantle. The second time we came to Ready Paint Fire, I wanted to paint something functional. They have so many choices, including a great selection of dishes for you or your pet. My house needed a spoon rest and they had one! With my item picked out, I decided on my colors. The reddish-brown, cream, brown, and darker yellow complement my kitchen. I thought for a while about what to paint. They have several widths of tape in the studio that you can use to make straight lines. I chose a thinner tape and laid out a pattern, making it up as I went along. When all of the tape was down, I painted in each section. When the paint was dry I peeled it off to reveal crisp white lines. I chose to leave the lines unpainted so they would be white in my finished piece. I love this spoon rest! It is very heavy and I don’t worry about it breaking. I hand wash mine so I imagine I will have this in my kitchen for a very long time. My last adventure with paint your pottery was at Pottery Fun. This studio is located in SE Portland, on Stark. I love this area and was excited to see this place open. Hopefully it will be around a long time. The studio is bright, with lots of tables, some big enough for really large groups to sit together. When you walk in, the unfinished pieces line the walls on both sides of the room. This place has something for everyone. There are so many awesome figurines as well as traditional items. 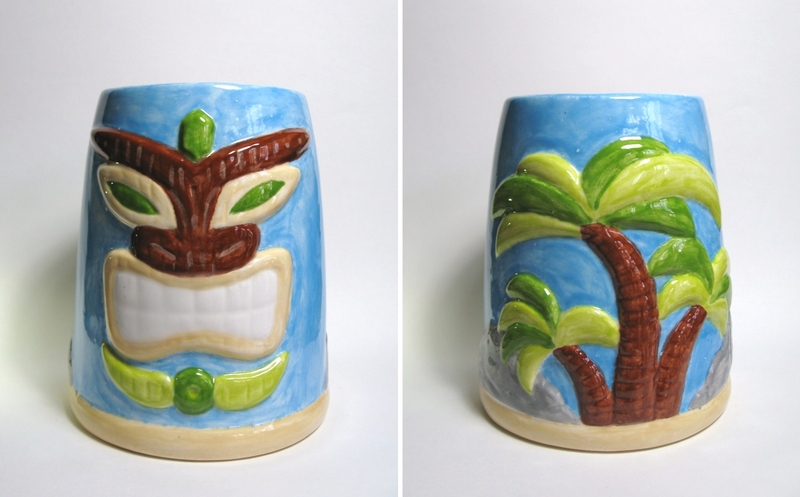 I wandered around the shelves for a while but couldn’t resist this Tiki mug. It just makes me smile. I painted it with bright colors and spend a long time carefully staying in the lines. With the background color, I picked a bright blue that has little flecks of white in it. If you are looking for something a little different, just ask! The staff are nice and will no doubt help you find just the right color or teach you a technique to use. After hours of painting, I left my mug in their capable hands for a few days to be fired. I hope this post inspires you to give paint your own potter a try. It’s a fun way to spend an afternoon with friends. If you need some “me” time, take your iPod and paint the day away in peace. Happy Easter! Today I want to share a quick and easy decorating idea with you. This piece goes together in less than five minutes, no glue required! To start, you will need a few items from the craft or dollar store. I got this little tin pail at Target, in the dollar bins area. 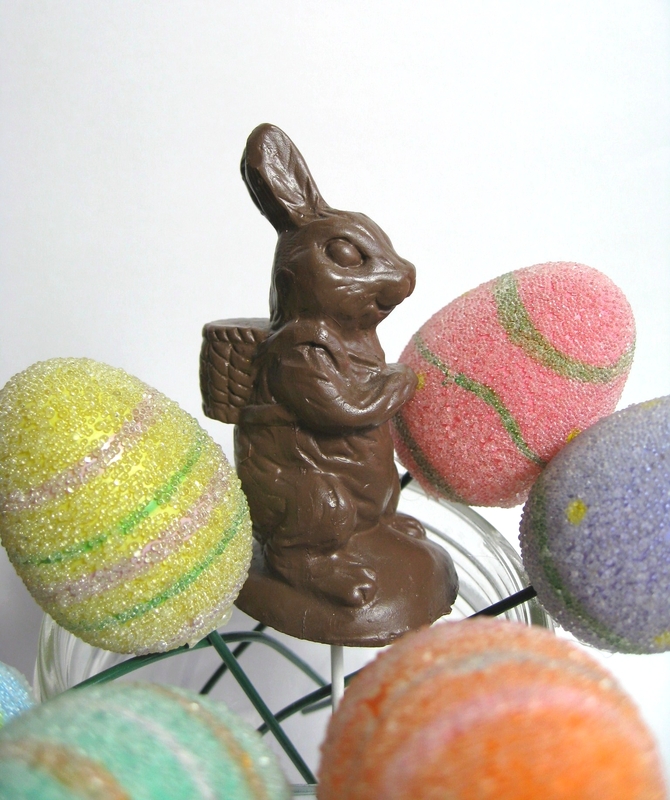 My faux chocolate rabbit and eggs came from the craft store. You will need foam to fill the base, I used packing peanuts. Last but not least, the grass. 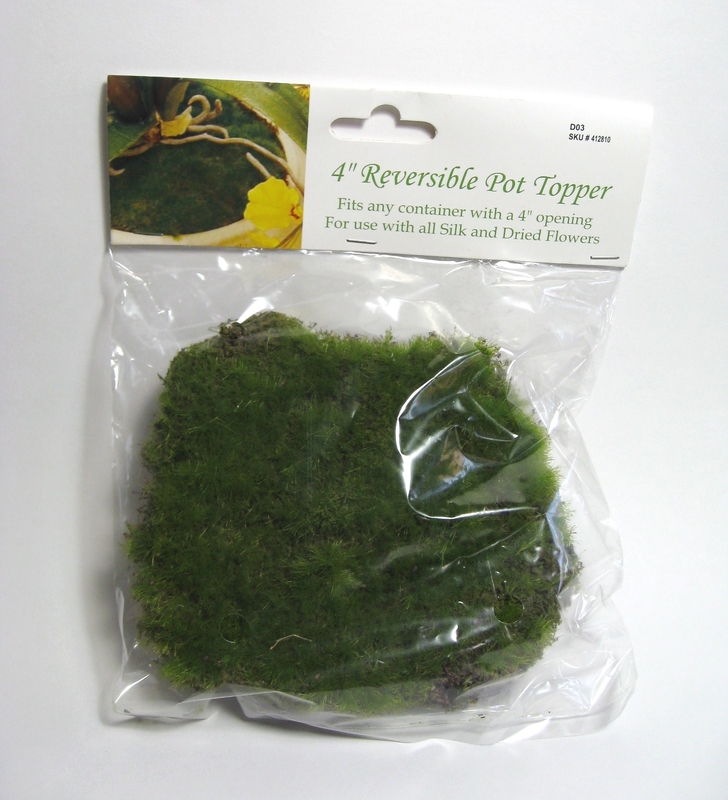 I’m using a round grass topper that I picked up in the floral section. The first step is to fill your pail or bucket, or basket. I filled mine with packing peanuts, but a chunk of Styrofoam or floral foam works too, whatever you have on hand. We just need something to support the grass, and act as a stabilizer for the decorative sticks. 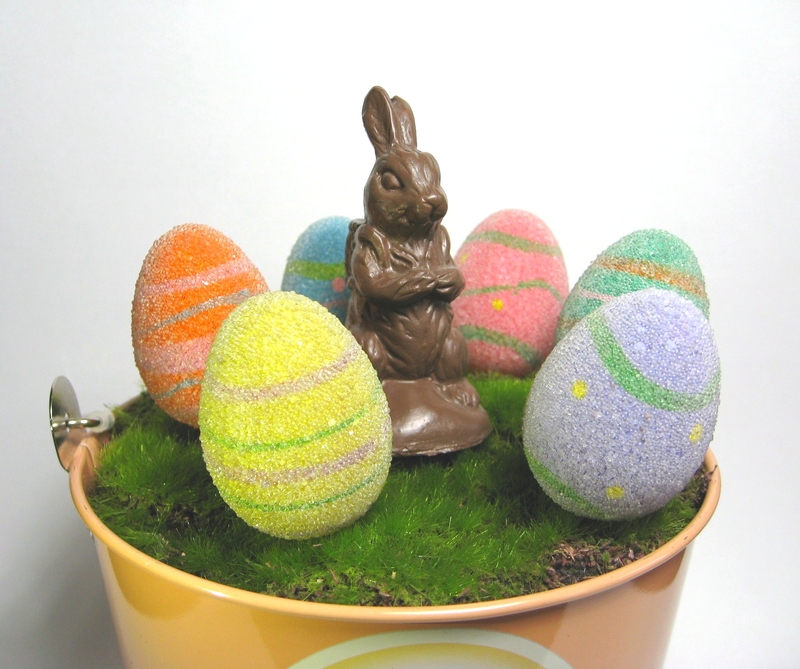 I’ve chosen these eggs because I love the clear sparkly coating on them. And how real does this bunny look!? They sold this guy in lots of sizes too. Notice that each decoration has a wire stick to support it, you can trim this with your wire cutters to fit whatever project you are working on. In this case, make them short enough to fit into your base container. To cover my foam, I’m using this pot topper. The top side is this lush green realistic grass and the bottom looks like dirt, it’s reversible! 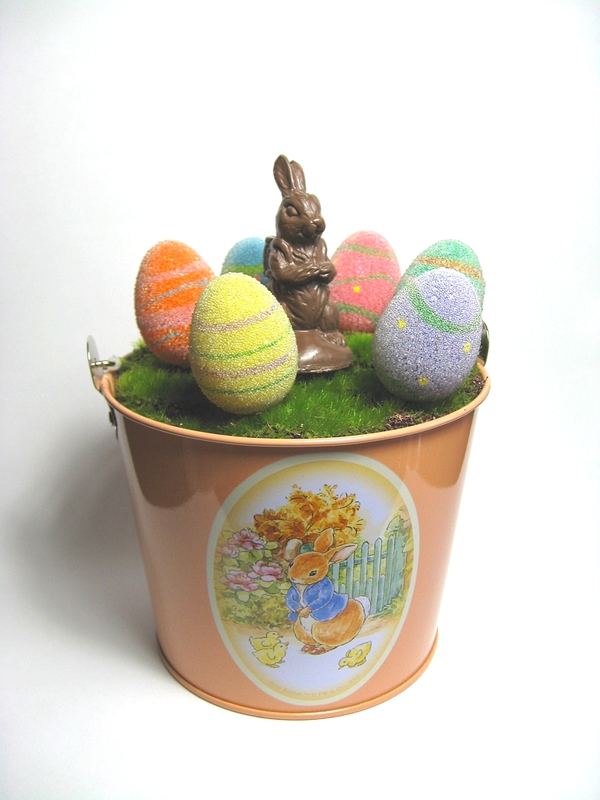 If you wanted to use traditional plastic Easter grass, you could. Just make sure you glue it down or secure it with pins. Using this pot topper requires no glue, just fit it on top of your foam, inside the base. Now, stick your little decorations wherever you like! The wire sticks will stab through the foam and hold it all in place. If you plan on turning it upside down you may want to put a little glue around the edge of the grass to keep it in place. How easy was that! 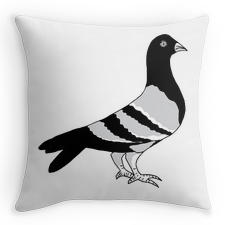 You can now use your fabulous decoration as a centerpiece or on a mantle. This is a low cost craft that anyone can put together. 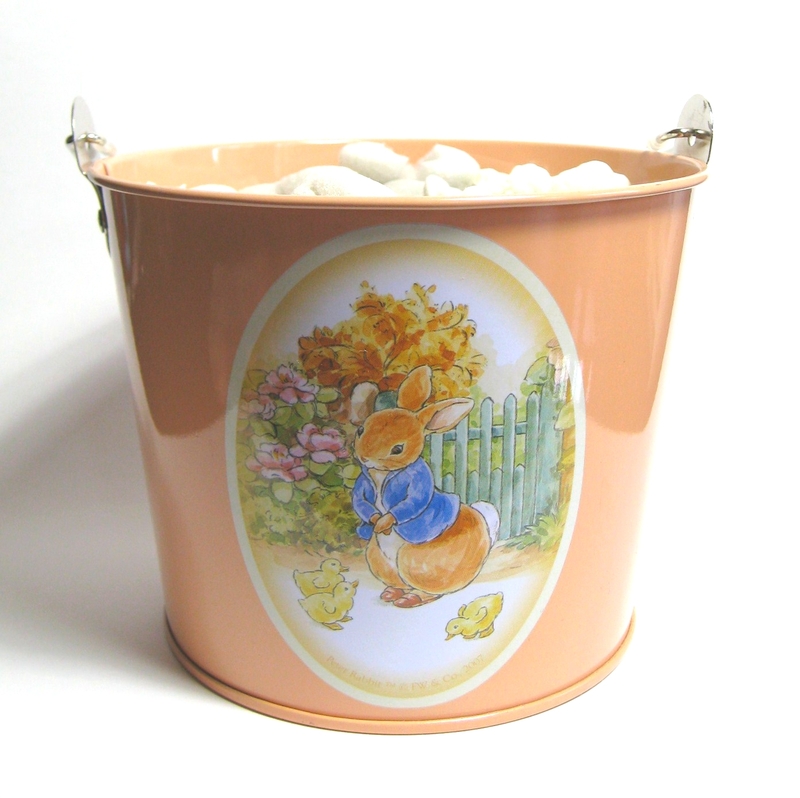 This little tin pail has a handle too, so you can take it along to give to someone special at your Easter celebration. Enjoy!